(CNN) -- The attack on the Sri Lankan cricket team in Pakistan has sent shock waves around the sporting world and raised fears about the future of international cricket matches, including the 2011 World Cup, in Pakistan. 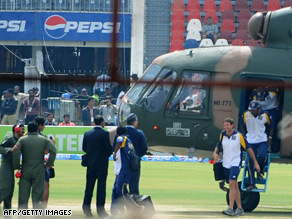 Pakistani air force helicopters evacuated the Sri Lankan cricket team after the attack. Pakistan, which is battling Islamist and Taliban insurgents in its North West Frontier Province, has struggled to attract visiting cricket teams in recent years because of security concerns. The current Test series with Sri Lanka is the Pakistani team's first since touring India in 2007. In 2002 a car bomb exploded outside a hotel where the New Zealand cricket team was staying. David Morgan, chairman of the sport's governing body, the International Cricket Council, said cricket "must go on, it will go on" after the attacks but admitted it was an "an "extremely sad" day for the sport. "The events can only be described as shocking and we send our sympathy to the relatives of those who lost their lives," Morgan said at a news conference in London. "On many occasions we've been told that cricketers would never be targeted in Pakistan. And this morning's events have proved that to be quite incorrect. "The world is a dangerous place, but cricket must go on. It will go on, it's a great game, and a great solace to so many people." Why were the Sri Lankans even in Pakistan? Gunmen opened fire on the bus carrying the visiting Sri Lankan cricketers, killing at least seven Pakistani security guards along with a driver and wounding eight cricket players and an assistant coach. A local umpire was critically wounded and is being treated at a hospital in Lahore, according to ICC Chief Executive Haroon Lorgat, who also spoke at the London news conference. He said none of the teams had been threatened before Tuesday's attack. Lorgat said the attack happened about 150 meters from the stadium in Lahore, and cricketers were "holed up" at the venue during the attack. Morgan said the ICC's board will be meeting in April to consider whether its 2011 World Cup -- slated to take place in the Indian subcontinent -- will include stops in Pakistan. "The board will have to think very carefully about the extent to which Pakistan will be used for that event," Morgan said. "It's a very important event, but the safety and security of players, officials and supporters is very important and the board will be taking that into account." "Pakistan has been struggling for a while. They hadn't played a test match in the entirety of 2008," Stern told CNN. "I do hope the cricket world will rally around Pakistan to find a way for the team to play outside of the country." He said one possibility was for the team to play its matches in England, which has a large Pakistani community. Former Pakistani bowler Waqar Younis said: "I don't see the International Cricket Council now allowing the World Cup matches in Pakistan. It's gone." "This has really damaged Pakistan," former Pakistani cricket player Zaheer Abbas told Geo-TV. "Already some teams didn't want to come to Pakistan. Now who will come after this incident?" Pakistan's Cricket Board had hoped Sri Lanka's tour would help it recoup some of more than $16 million it was set to lose as a result of India's cancelation. The Sri Lankan offer to tour was a reciprocal gesture. Pakistan was one of two countries that agreed to play in Sri Lanka during the 1996 World Cup tournament after other countries refused to travel there because of security concerns over the country's civil war with Tamil separatists. Indian Premier League chief Lalit Modi also expressed his regret over the attack. "We were indeed shocked to learn about the dastardly attacks on the Sri Lankan cricket team and hope for the safety of all the players and officials involved. "The Indian Premier League strongly condemns these attacks on sportsmen and the sporting fraternity at large which is quite unprecedented. My heartfelt condolences go out to the friends and family of the deceased ... and we wish all the injured Sri Lankan cricketers a complete and speedy recovery. "This attack is unparallel in terms of the target -- which was the Sri Lankan Cricket Team. Especially since the Sri Lankan team were on a goodwill mission to facilitate Pakistan's re-initiation into the global cricketing fold." The Indian government has urged the IPL to review its "security requirements" for next month's cricket tournament in the light of forthcoming general elections, a top Home Ministry official said Tuesday. Home Secretary Madhukar Gupta told CNN there were security and other concerns because the tournament was "co-extensive" with general elections starting April 16. The IPL had announced its schedule for the matches before poll dates were fixed. IPL matches will be played in different parts of India from April 10 through May 24, according to its current schedule. India will be voting to choose a new government on April 16, April 23, April 30, May 7 and 13. Pakistani politician and former cricket captain Imran Khan condemned the security arrangements in Lahore. "It's very tragic that the policeman was killed, but had there been the proper security like it is provided to some of the senior ministers in the government, they would not have been able to approach the bus. ... I think that this was a serious lapse in security." The English Cricket Board also expressed its shock. In a statement it said: "Our thoughts are with the families of those who have been killed or injured in this despicable attack. The ECB has also been in touch with both boards, the ICC and the Sri Lanka team to offer their thoughts and condolences to those involved."